Though I’ve only participating in Food ‘n Flix for a year now, this is actually the club’s 5th anniversary! For the 5th anniversary, Heather from Girlichef is opened up this month’s viewing to any of the previously chosen movies! I originally intended to watch something new, in fact I nearly watched Chocolat (I still will someday). But then I saw How to Lose a Guy in 10 Days as one of the choices. I LOVE that movie! I first saw the movie the year Hubs & I were engaged and planning our wedding. And I fell in love with the song, Feels Like Home that appears during the (totally PG) shower scene. In fact, Hubs & I chose that song for our first dance as husband and wife. So How to Lose a Guy in 10 Days had always had a soft spot in my heart. There are many food choices in this movie. The most obvious is lamb with cherry glaze, but I’ve never eaten lamb before, much less cooked it myself, so that was out. There’s also the giant hamburger Andie eats, or the vegan barley bowls when she’s pretending that she doesn’t eat meat. And there’s also tons of game food and New York City street vendors. And that’s where I finally drew my inspiration. *If you do not have a poppy seed bun, take a regular hotdog bun, brush it lightly with melted butter and sprinkle with poppy seeds. Cook the hot dog on the grill. Place the mustard on the bun. 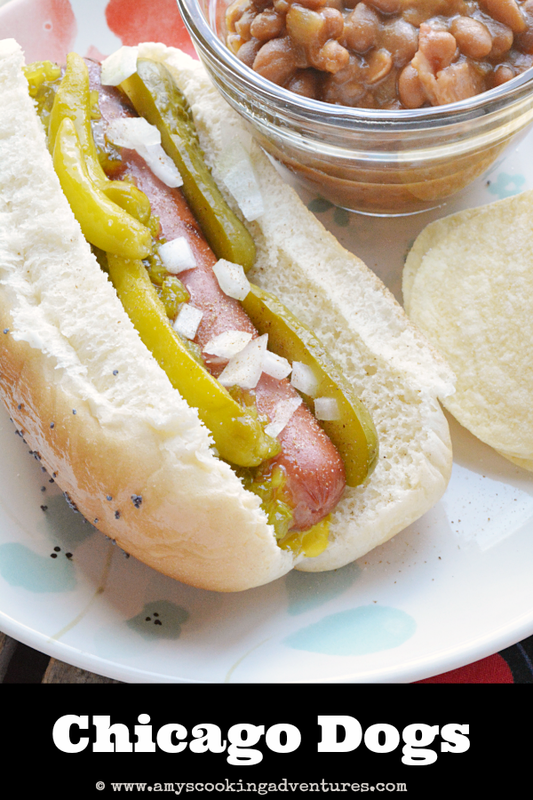 Top with the hotdog and pickle relish. 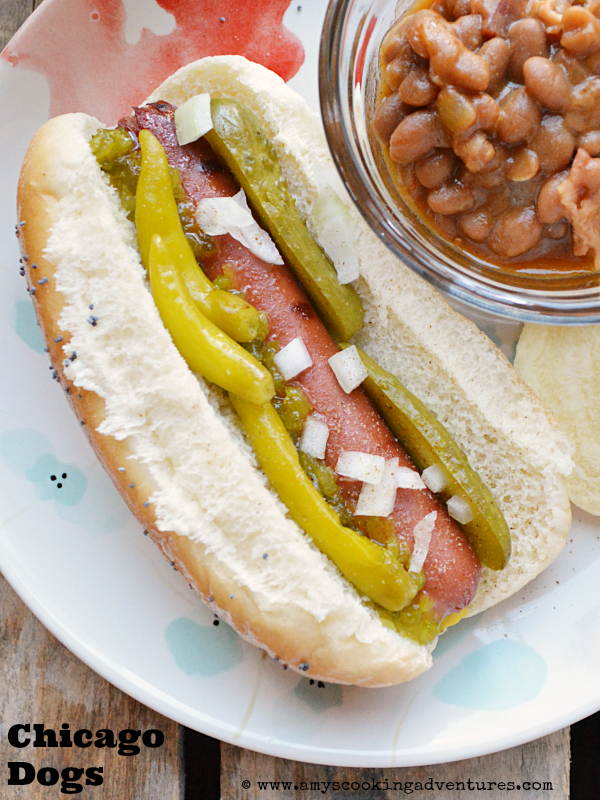 Add the sport peppers and pickles on either side of the hotdog. Sprinkle with diced onions and celery salt and serve with a side of Easy Baked Beans. I have never seen that movie. I rewatched Julie and Julia last night, now I just need to narrow it down to a recipe!! When we watched this movie the first time around I made the big hamburger. These dogs look great! I ~think~ I've settled on Mystic Pizza for my choice. I love this movie! I can watch it forever. I cannot believe how easy it is to mimic a poppyseed bun. Good grief. All these years wasted on plain buns. Thanks for the inspiration! I did watch Chocolat for my movie! Crazy you going for a Chicago dog instead of an NYC one ;-) I did not think Chicago Dogs would impress me when I went but I am a convert, great recipe.